Have you ever taken a stand on something and then wished maybe you hadn’t done so in a public manner so that you could quietly go back on your word? Because this is me right now, with the Bears. I feel like I just told the world I am giving up chocolate for Lent and the planet’s most delicious brownie is sitting in front of me and Easter is still a month away. 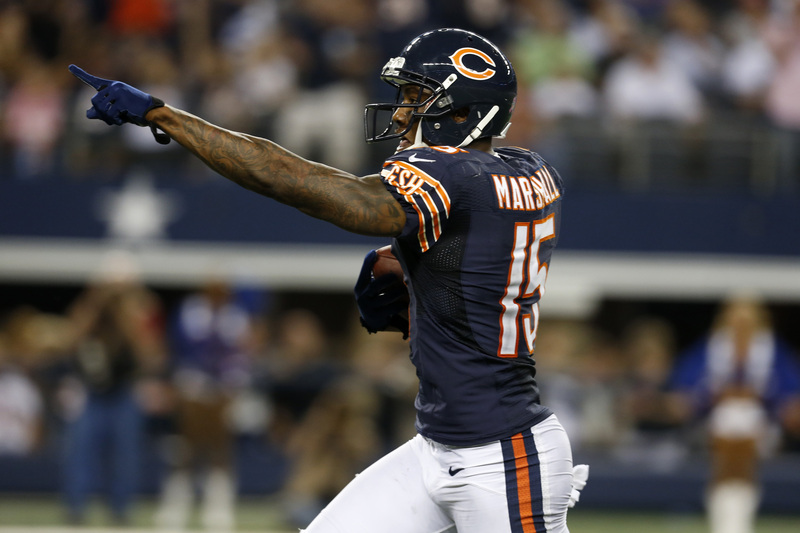 I’m having second thoughts about my plan to boycott the Chicago Bears this season, stemming from my issues with Brandon Marshall’s off-field behavior. I have been good so far: I haven’t tuned into a minute of a single Bears game, not on TV, not on 780-AM (I miss you, Jeff Joniak! You and your Wheaten Terrier), not on real-time Internet scoreboards. But I’m starting to weaken. And here’s why. All right, I feel gross just typing the majority of that paragraph. While I believe Marshall has legitimate struggles with mental health issues and I am happy that a professional athlete is willing to be the face/voice of that, you can’t really convince me that a completely innocent fellow was unfairly accused of all this stuff and had nothing to do with any of it. And there’s a larger problem with the ridiculous levels at which professional athletes are forgiven for bad behavior, particularly violence against women. But ignoble truth is that I just miss football. Of course I would decide to take a stand during a season where the Bears actually are looking pretty good, one Packers game aside. The Bears are the only real team in this city that (just about) everyone can get behind. Chicago comes together on a game day. It’s strangely lonely to know I am purposefully sitting out something that so many people are so into, that I would otherwise be into. And nothing is sweeter in the fall than hunkering down on the couch with some comfort food and maybe the newspaper and letting the NFL themes and whistle chirps and idiotic bro-y beer commercials be the soundtrack of the afternoon. It’s like a fall without pretty leaves, warm sweaters, or the Facebook photos of your friends who took their kids to the pumpkin patch. Additionally: Somebody gave us a really cute Bears onesie for the baby and I want to put it on him. So tell me: Should I go back, carefully, on my word and get back with these Bears? Or should I stand strong?